This series delivers the latest knowledge of burn management by Professor Jang Youngchul, a world-renowned authority on burn management at the Burn Center of Hallym University's Medical Center in Korea. Prof. Jang will introduce the diagnosis and classification of burns, management of acute burns, treatment of burns, advanced dressing materials and the use of cultured epithelial cells such as keratinocytes. The most important step in determining the direction and method of burn management is to pinpoint the extent and depth of the burns. For example, burns covering 20% or more in adults are presented as a systemic reaction and require fluid therapy. 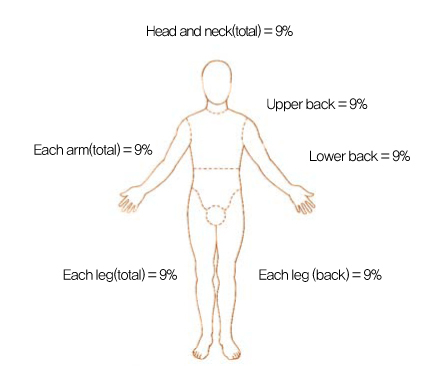 The area of the burn is indicated as a percentage (%) of the total body surface area (TBSA). 2nd and 3rd degree burns are included in the TBSA percentage while 1st degree burns are excluded. ① Rule of 9’s: The burned area can be calculated easily and quickly by dividing the body into upper and lower limbs on both sides, torso, head and genitalia. Being a rough calculation, this method is less accurate, though commonly used in emergency unit. The percentage of each body section of TBSA of infants and children is different from that of adults. Therefore, the following chart is used for more accurate estimation (Figure 1). In general, head and neck account for 19%, and each leg accounts for 13% in a 4-years-old or younger child, unlike 9% and 18%, respectively, in an adult (Figure 1). ② Lund and Browder chart: This method of measuring burns by age is more accurate but also more complex than the rule of 9’s, and is often used for permanent medical records. ① First degree burn: These burns are confined to the epidermis and are generally sun burns. Painful erythema and edema recover spontaneously without special treatment, and most of these burns do not scar. ② Second degree burn, or partial thickness burn: This type of burn affects both the epidermis and part of the dermis. Blisters (bullae) may develop, indicating partial damage of the dermis under the blister. Recently, 2nd degree burns have been subdivided into superficial, mid, and deep 2nd degree burn categories. 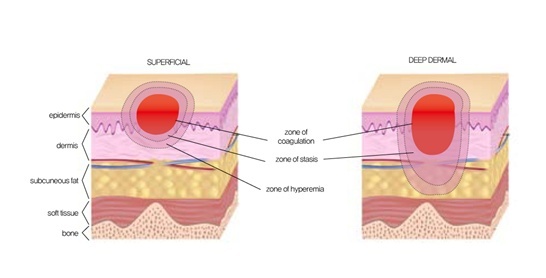 ②-1 Superficial second degree burn (Figure 2): These burns affect the entire epidermis and upper third of the dermis, including the papillary layer of the dermis. Edemas and red areas are painful when disturbed. Most of the burns recover within two weeks and may leave slightly rough and weak scars accompanied by the appearance of wide pores, hyperpigmentation, or hypopigmentation. 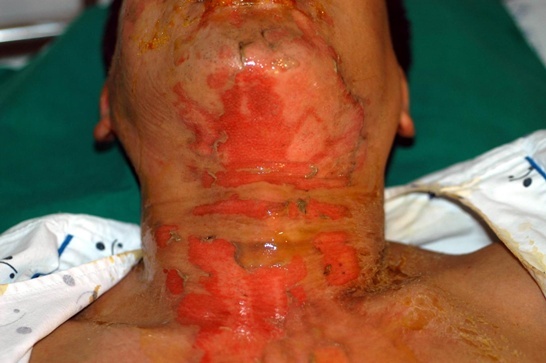 ②-2 Mid second degree burn: These include the epidermis and the extend to about half of the dermis. Treatment requires 2-3 weeks, and the wound may extend to classification as a deep dermal burn if treated improperly. The scar is more severe than the weak scar observed in superficial second degree burns. Continuous prognoses should be made for more than 3 months in children or for injuries at joint areas with much momentum so that the burn does not develop a hypertrophic scar. ②-3 Deep dermal burn: This type of burn affects the most reticular layer of the dermis and extends down to about 3/4 of the dermis. It requires 3-4 weeks of treatment, sometimes including even escharotomy and skin grafting, and leaves severe scars, with high possibilities of developing into hypertrophic scars. Skin grafting should sometimes be considered for children, at the finger joints or other joint areas. 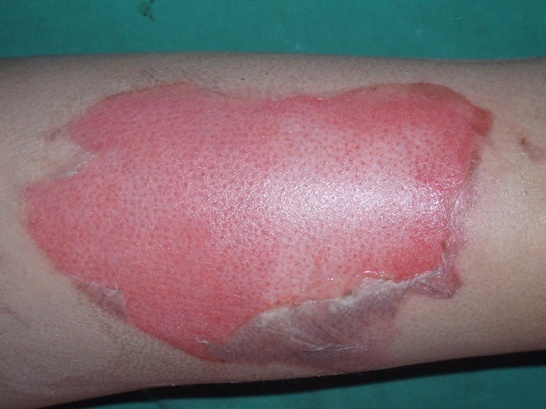 Inappropriate treatments, including drying up of early burns, dressing which prevents circulation, or measures liable to infection, may worsen the burn to a third degree burn. ③ Third degree burn, or full-thickness burn (Figure 3): This type of burn affects more than 3/4 of the dermis and makes the skin look pale like beeswax, brown, or black, with a dry leathery texture and even the development of thrombi in some cases. External stimulus does not trigger pain or any sensation. Recovery takes from weeks to months since most of the pilosebaceous organs, which are essential for external wound recovery, are damaged, preventing epithelialization from the lower layers of the skin. The recovery time can be shortened by performing skin grafts. Narrow wounds and wound contractions can recover in some cases via slow epithelialization, but skin grafting or skin flaps are more beneficial in terms of both aesthetics and functionality. ① Minor burn: A second degree burn accounting for up to 10% of TBSA in children and up to 15% in adults, or a third degree burn accounting for up to 2% of TBSA regardless of age. 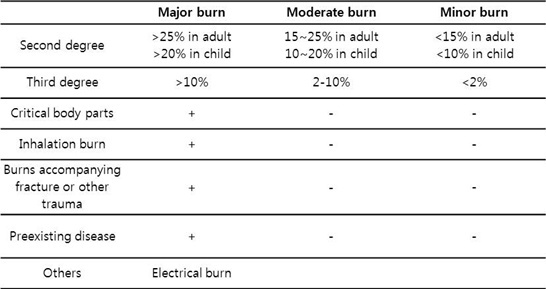 ② Moderate burn: A second degree burn accounting for 10-20% of TBSA in children and 15-25% in adults. ③ Major burn or critical burn: A second degree burn accounting for 20% or more of TBSA in children and 25% or more in adults, or a third degree burn accounting for 10% or more regardless of age. Not very extensive burns involving 1) critical body parts such as the face, hands and perineum; 2) injuries via inhalation; 3) severe injuries via electrical or chemical means; 4) fracture or other serious trauma; and 5) preexisting diseases, such as severe diabetes or cardiopulmonary diseases are all also termed as critical burns and included in the major burn category (Table 1). The pathophysiology of burned tissues should be first understood to manage burns properly. 1. High temperature induces rapid denaturation of proteins as well as cell injury. The degree of tissue damage is proportional to the temperature and duration of exposure, and can also be determined by the medium of heat transfer. Hot water transfers heat more rapidly to tissues (scalding burns), whereas contact thermal burns cause deeper injuries. Burns may occur not only by a very high temperatures, but even at only 6℃ from core temperature (37℃) as low-temperature burns. Body cells may be damaged and thrombi may develop immediately from a body surface temperature of 60℃. People with thin skin, children or elderly people may suffer deeper burns more easily. Tissues can be damaged not only by direct tissue damage via heat but also by toxic mediators, produced by generally or locally activated inflammatory responses. Inflammatory response is required in the process of would recovery, but excessively produced oxidants or proteases may aggravate capillary endothelia and damage skin cells. 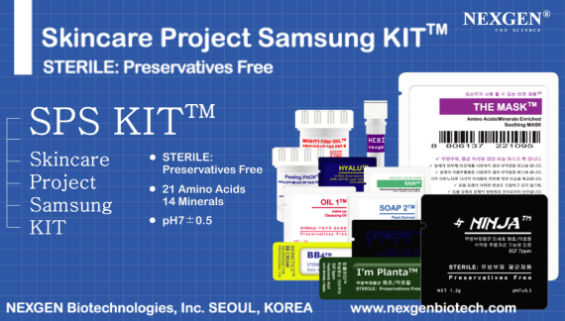 Protease, among other proteins, directly damages recovering tissues and neutralizes growth factors, while oxidants damage cells or denaturize proteins while furthering inflammation. Activities of these mediators need to be prevented in the early phases of recovery. Injured capillaries continue to develop thrombi and induce more severe ischemia and tissue necrosis. Systemic hypotension and local circulatory disorders also induce similar effects. Tissue damage may continue even beyond what is caused by the initial burns and mediators. 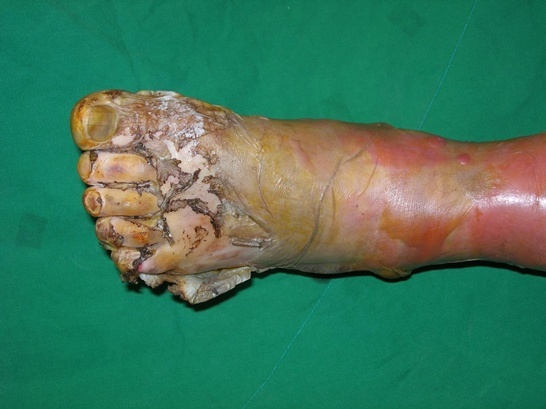 More specifically, eschar on the burned area, bacterial colonization, mechanical trauma, and even topical antibacterial agents may be factors in developing complications later on. Excessive neutrophils and intense proteolytic activity at the site of injury can delays recovery. Another important concept of burn management is dividing the burned area to three zones. This more abstract concept attempts to use tissue reversibility to switch a zone of stasis to a zone of hyperemia, which can be recovered within days, by intensive treatment in the early phases of the burn. ① Zone of coagulation or zone of tissue necrosis: This irreversibly damaged zone requires escharectomies to prevent tissue necrosis. ② Zone of stasis or zone of tissue injury: This zone develops necrosis within 24-48 hours without special treatment. Continuous fibrin deposition, vasoconstriction and thrombosis leads to ischemia and cell damage. In order to prevent the burn from extending into a deeper layer, a proper environment should be made early on to gain an opportunity for tissue recovery. Flushing the wound with cold running water, administration of an anti-inflammatory drug, and providing a damp wound environment immediately after burn infliction may be helpful. ③ Zone of hyperemia: This zone has less cell damage and is reversible within days in the absence of dryness, circulatory disorder due to edema, infection or severe inflammatory response. 6. Wound conversion: This refers to conversion of a deep second degree burn to a third degree burn and may occur when circulation at the affected area is reduced, treatment is delayed, and the presence of excessive inflammation or sever infection hinders the burn. This also refers to conversion from a zone of stasis to a zone of coagulation.